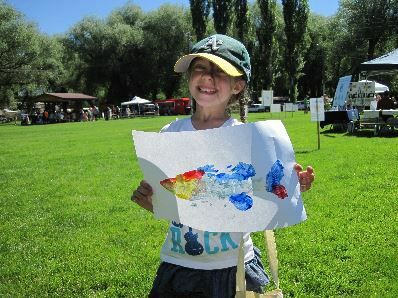 After enthusiasts had to brave bad weather last year, the forecast looks good this year for the 16th annual Bear River Celebration and Free Fishing Day to be held Saturday at Willow Park. The celebration goes from 10 a.m to 2 p.m. and features interactive exhibits and live animals native to the Bear River area. On <a href=”http://610kvnu.com/assets/podcaster/324/2017_06_08_324_58451_2867.mp3″ target=”_blank”>KVNU’s For the People program on Wednesday</a>, USU Water Quality Extension program coordinator Eli Robinson said, “yeah it’s a free event and if you bring your child and complete all of the stations, I think it’s like 15 stations now, from face painting to fishing to looking at macro invertebrates to learning about water chemistry…all things related to having a healthy Bear River watershed. He explained that the Bear River is the largest tributary to the Great Salt Lake. So in addition to providing a lot of fun for families, this event is about raising awareness of the Bear River Watershed which encompasses parts of three states: Idaho, Wyoming and Utah. In this state it drains the high Uintah mountains and hundreds of thousands of people interact with the watershed and their daily actions can influence the the quality of the water. As far as the fishing is concerned, don’t know how to fish or don’t have a pole? No problem! “You don’t need a license and we actually have fishing rods that you can borrow as well from us. You just need to bring a kid down there and we’ll teach them how to fish. Fishing is a great way to experience the watershed. Robinson said they have stocked the Skylar Pond at Willow Park West with lots of rainbow trout, blue gill and more. For more information on the Bear River Celebration call Robinson at (435) 797-2580 or visit <a href=”http://extension.usu.edu/waterquality” target=”_blank”>extension.usu.edu/waterquality</a> then scroll down to Upcoming Events.